If you are a victim of family violence - you're not alone. We now lead the world in domestic and intimate-partner violence statistics. And the details in those statistics is alarming. We've included some of them at the bottom of each page of this website. One of our member organisations, Women's Refuge, has an excellent resource on the types of family violence impacting us in New Zealand, and what it costs us in human and economic terms. Family violence can take place in any home or community. It happens in rural and urban areas, within all age, religious and ethnic groups, and across the whole socio-economic landscape. ​​​Whatever your culture or background, you’ve got the right to ask for help. So just what is domestic violence? 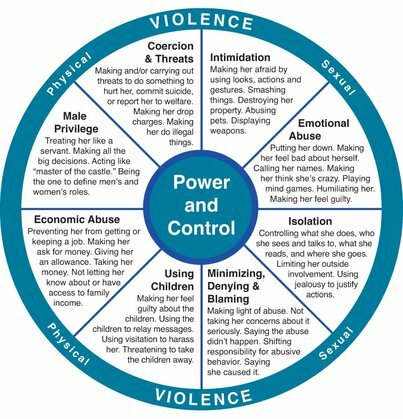 Domestic and family violence (also known as domestic violence, family violence or partner violence) is a pattern of abusive behaviour in an intimate relationship that over time puts one person in a position of power over another and causes fear. It is often referred to a pattern of coercion and control. The violence may be physical, sexual, emotional/psychological, financial/economic or spiritual. There are many things that keep women in relationships with someone who abuses them. Being in a violent relationship can erode self-esteem and lead to low confidence. This can occur after even a short period of abuse. Abused women are not weak, submissive victims. It takes huge strength to live with an abusive partner. Women have to be strong and resourceful, adopting all kinds of coping strategies to survive each day. Finding the strength to leave an abusive relationship can be very hard. We are here to help. What sort of person commits family violence? An abuser rarely takes ownership for the violence and abuse they display. Instead, an abuser will typically blame external circumstances for the way they behave - it's not their fault. What are the signs I'm in a relationship with an abuser? Blaming the victim for their behaviour: "You made me do this, it's your fault"
Controlling what the victim wears and how they act. Punish someone for doing something. Violence is not just physical. It includes threats, intimidation, put-downs, humiliation, sexual abuse, twisting of words or playing mind games. Violence is frequently blamed on poverty, upbringing, anger, alcohol, drugs, lack of communication, jealousy, mental illness, stress, illness and lack of education. But many people experience these without using violence. Most people who use violence at home are able to be calm, patient people outside of home. Many victims of domestic violence talk about how the person abusing them can switch to their nice side if visitors suddenly arrive. Abuse is NEVER your fault. No matter what your abuser says or how they make you feel. We have a member Network of organisations who are just a phone call or visit away. If you or your children are victims of family violence, ACT NOW. Contact the agency that has the service you require. If you are in serious, immediate danger, dial 111 NOW. 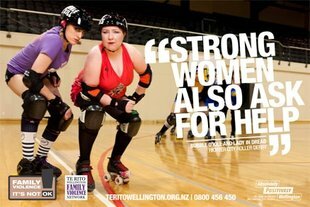 If you are unsure who you should contact and your situation is URGENT, phone 0800 REFUGE or 0800 733 843 to talk to Wellington Women’s Refuge or Te Whare Rokiroki Māori Women’s Refuge. New Zealand has the worst rate of family violence and intimate-partner violence in the world. A shocking 80% of incidents go unreported. In 2015, NZ Police attended 105, 000 family violence incidents. If all incidents were reported, they would have attended at least 525, 000 calls for help.